The Traditional Hanok House in South Korea is an authentic experience where you get a glimpse of the culture, environment and lifestyle of the Korean society. While many have been adapted to accommodate the advances of technology, there is still a strong sense of the warmth and wonder of the past weaved through each home. These traditionally Korean houses were built of materials that came from the local environment; wood and earth, stone and paper were commonly in use. Between the residences of nobility, giwajip and those for the poor, chogajip, there was only one notable difference, that being the roof. Clay tiles, giwa, were used for the upper class bringing with them a greater sense of permanence, while the peasants relied on straw thatching. 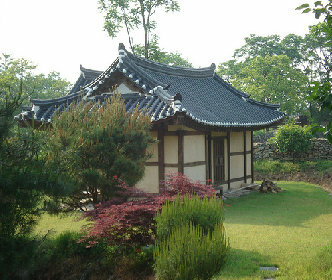 The orientation of the traditional Korean House is also a matter of some significance. Reflecting the cultural tenets of Korean culture, the house faced a river while the back nestled towards a mountain. The heated rock system or ondol, warmed the house during the colder months and for the hot periods of the year, a broad front porch or daecheong, allowed for a free flow of cool air. An alternative accommodation to hotels, this is an opportunity for a traveler to stay in a traditional Korean house. Even with the tweaking and twisting needed for a television to appear a natural feature, there is still plenty of atmosphere and aura around a time honored Hanok House.